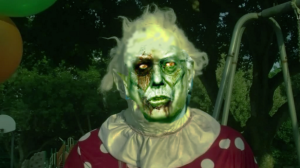 This Creepy 74-Year-Old Socialist Clown Will Terrify Your Misbehaving Kid For Cash! Desperate parents in Burlington, Vermont have a new weapon in their arsenal for reining in misbehaving kids. His name is “Wrinkles,” and he’s a creepy-looking clown who has been spotted at gatherings, in public and outside people’s homes for the past few years, according to the Burlington Free Press. Wrinkles’s real face remains hidden beneath a distinctive mask with large black eye holes and receding white hair. He favors a polka dot onesie with black rubber gloves and he’s rarely seen without a bundle of colorful balloons in one hand. A slight paunch gives him the unnerving appearance of a menacing, man-size baby who lurks in sewers and children’s closets. For a few hundred bucks cash, he told Burlington Free Press, he’ll make an appearance at your party or gathering, prank your friend or even scare your misbehaving kid straight, as he was recently hired to do by one mother looking for a way to reform her trouble-making 12-year-old. Wrinkles declined to give his real name, but said he’s a 74-year-old Brooklyn transplant and politician who worked various jobs throughout his career. For Wrinkles lovers, his appeal is partly a result of his terrible attitude. Unlike nice clowns who socialize children, Wrinkles isn’t particularly fond of young people and got bored making “stupid little balloon animals,” he said. In a world sanitized by glossy reality television shows and helicopter parents who obsess over their kids’ feelings, Wrinkles considers himself a remnant of a forgotten past. “I want to bring scary back,” he added. And yet, sometimes scary comes to him, he noted. Wrinkles said he has received requests from people to help them dump a body and regularly receives explicit requests to engage in lurid behavior. He usually declines, he said, and noted that he accepts only cash and entertains serious requests for his services. Right now, he said, he’s booked through November, 2016. “I’m hoping to have a new job by then” he said. Never tired of dumping a body or helping people live out their strange fantasies, Wrinkles said, he’d really prefer to do his act at the 2016 Presidential Inaugural Ball. “I may be 74, but I can still cut a rug,” he said. The Complete Donald Trump SNL Videos, 11/7/15 – Highest Quality!